Surface Structure and Reactivity of Iron Oxide-Water Interfaces. 2. Anion Sorption Topology on Hematite: Comparison of Arsenate and Silicate. 3. Molecular Structure of Lead(II) Coprecipitated with Iron(III) Oxyhydroxide. 4. Tracking the Interaction of Transition Metal Ions with Environmental Interfaces using Second Harmonic Generation. 5. Prions, Metals and Soils. 6. Associations between Iron Oxyhydroxide Nanoparticle Growth and Metal Adsorption/Structural Incorporation. 7. Temperature and Aging Effects on the Surface Speciation of Cd(II) at the Goethite-Water Interface. 8. Cadmium and Lead Desorption from Kaolinite. 9. Mechanism of Molybdenum Adsorption on Soils Minerals Evaluated using vibrational spectroscopy and surface complexation modeling. 10. Blind Prediction and Parameter Uncertainty - A Sorption Test Case. 11. Biogeochemical Uranium Redox Transformations: Potential Oxidants of Uraninite. 12. Phosphate Interactions with Iron (Hydr)oxdes: Mineralization Pathways and Phosphorus Retention upon Bioreduction. 13. Influence of Phosphate on Adsorption and Surface Precipitation of Lead on Iron Oxide Surfaces. 14. Uranium(VI) Release from Contaminated Vadose Zone Sediments: Estimation of Potential Contributions from Dissolution and Desorption. 15. Arsenic Speciation in Solid Phases of Geothermal Fields. 16. Reactive Transport and Residence Times in Unsaturated Fractured Rocks from Field-Scale Experiments. Adsorption of Metals by Geomedia II serves as a needed resource for this topic which has received much attention during the past 25 years. 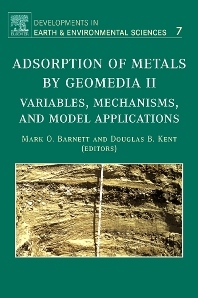 The book provides an in-depth review of the field, followed by numerous chapters that document the current status of adsorption research for a variety of metals by geomedia ranging from individual minerals to sediments and soils. Adsorption mechanisms are detailed and precipitation is presented as a distinct sorption process. Virtually all factors affecting the extent of metal adsorption are examined, including the effects of selected anions, competition among metals, pH, metal concentration, loading, variable metal adsorption capacity, ionic strength, hydrogen exchange and stoichiometry, and solids concentration. A variety of adsorption models are briefly presented and some are used to extend laboratory studies to field sites. This is a compilation of 25 peer reviewed papers from among the 60+ platform and poster presentations of the symposium "Adsorption of Metals to Geomedia II" at the American Chemical Society (ACS) Meeting, March 27-29, 2006 in Atlanta, Georgia, USA. This symposium is a follow-up to the original held in 1996.